Marvin Kinsey runs against Florida. He's shown bursts of speed all season long but has been limited in his carries. Credit: Kim Klement, USA TODAY Sports. There are a magnitude of reasons why the 2018 season has played out so poorly for the Colorado State Rams, who fell to 3-6 last night after getting dominated by rival Wyoming at home 34-21. Everything bad about the 2018 season came to light during CSU’s third consecutive “Border War” defeat. There was a slow start, missed tackles, poor offensive line; you name it. There are no excuses left and it is difficult for even head coach Mike Bobo to remain positive, although that was his goal at the beginning of the season. It’s true. CSU’s bitter rivals outplayed them in every facet of the game. Still, after digesting the outcome and reflecting on what specifically went wrong, thoughts resort back to Colorado State’s inept run game. The fourth-year head coach, who may be on the hot seat after losing and eight straight rivalry game, admitted that he “Basically didn’t have any confidence in the running game,” on Friday night. I can’t blame him for that. The Rams accumulated a total of 20 rushing yards in four full quarters of football on Friday night, with their home crowd there for support. That is downright disgusting. CSU has been out-rushed in eight of nine games this seasons. The 2018 Border War marks the third game this season in which the Rams have combined for 70 or less rushing yards as a team. 70! That’s unacceptable. There are three seemingly capable running backs on this team who together are averaging 108.6 yards on the ground each game. Maybe they just aren’t capable. Or maybe the problem lies within the green and gold’s offensive line. That line has been a “MASH” unit lately, dealing with the injury of center Colby Meeks, who was in for the Border War, but had to adjust to the position switch from guard this year. Either way, the running game issues don’t look like they will be solved any time soon. And it has truly hurt the Rams more than most things this season. The non-existent rushing attack was detrimental on Friday night more so than ever, given the circumstances. Collin Hill made his first start in over two years against the Cowboys. Hill played well in the fourth quarter against Boise State one week ago. The redshirt sophomore finished the game 12-14 for 135 yards and one touchdown. Progression in Hill’s game is evident, otherwise Bobo wouldn’t have had him start it. Still, he needed to be able to lean on the run game at times on Friday and couldn’t. To put this into perspective, Hill threw 54 times against Wyoming last night. Even Bobo himself admitted, “You aren’t going to win a lot of games when you throw it 54 times.” Agreed. That statement goes for most collegiate quarterbacks, not just Collin Hill. Friday marked the quarterback’s fifth career start. Hill averaged only 30.8 passes per game in his previous four starts as a true freshman. The rancid rushing attack forced the two-time ACL tear recovering quarterback to produce everything for CSU offensively. There is no way in hell that was the game plan, and anyone who watched the game knows why. The Rams possess an above average passing game. But, even if it was the best in the country, no team survives on being one-dimensional. At least in the vast majority of circumstances. Well, the one-dimensional CSU offense got trounced to Wyoming, as it did when it rushed for 70 yards against Florida in a 48-10 defeat earlier this season. The stunning victory over Arkansas, a game that the Rams totalled 40 rushing yards, is looking more and more like a miracle each week. 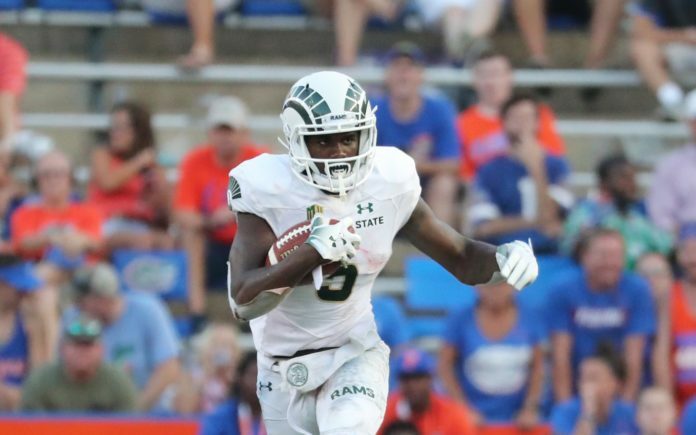 A miracle that will most likely never occur again if CSU can’t figure out in some way, shape, or form how to establish a semi-decent run game. It starts up front with that banged-up offensive line, who through nine games, should have progressed as a unit. It continues with the running backs, and while Izzy Matthews was slowed by injury, Marvin Kinsey showed on two brilliant runs for touchdowns he should have been in more this season. And it ends with play-calling, which is Bobo’s domain.